Linnet's Wings is a 1968 23' South Coast Seacraft Alberg sloop Hull Id: MSZ00182A292. 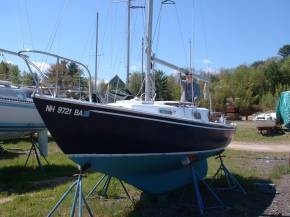 She has a 2' 10" full shoal draft keel. Sleeps 4 with a displacement of 3500 lbs. 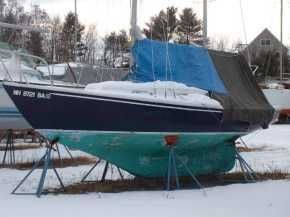 She is currently up on jack-stands in the Great Bay Marine boat yard, Newington, NH (Row 8, Lot #9). 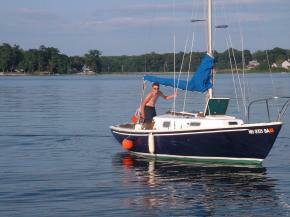 I have a deep water mooring permit good for the 2006 season - a huge benefit from buying from me now! 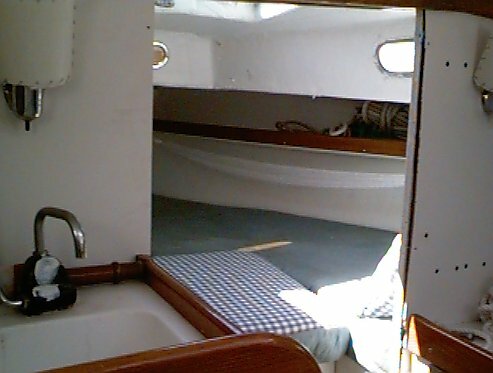 She is a steady sailing boat with a nice sized cockpit and surprising room (and headroom) below. Sleeps 4. 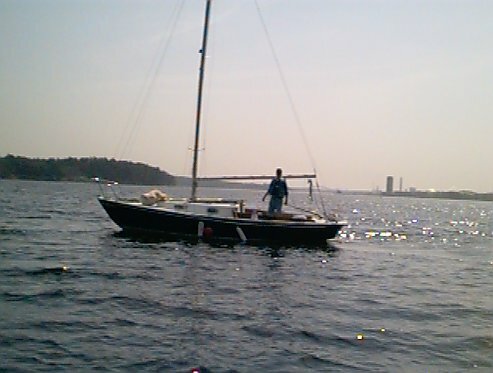 I have had her out in some pretty good blows with waves crashing over the bow and drenching me aft and she has held up just fine. But she is old and in need of much love and care. 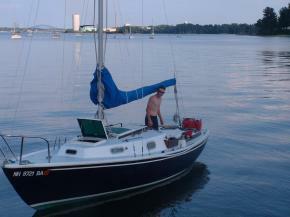 I bought her for that reason: I wanted a boat that I could just sail and not worry about keeping pristine. 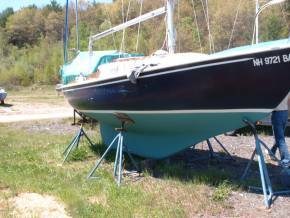 We all have dreams of restoring an old boat, but I never found the time to do anything but sail. 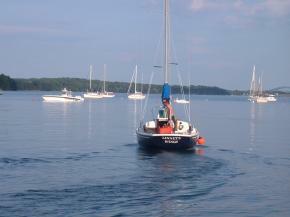 If you just want to sail and not worry about keeping appearances up, then this is the boat for you! 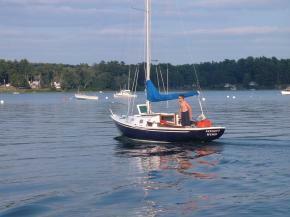 If you are looking for a boat to restore, this is the boat for you! 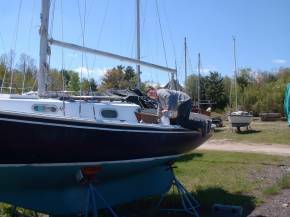 She comes with a 15 hp Evinrude 1978 Model: 15805B S/N: E0001928, 5 sails - 2 mains, 2 jibs, 1 spinnaker and a blue mainsail/boom cover. 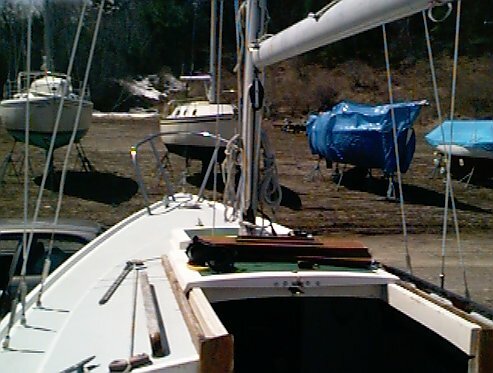 There is a porta-potty, various life jackets, lines, anchor and about 120' rode, large canvas cover tarp, dock lines and fenders, cushions for below - though need recovering, and other assorted gear. Below, there is a sink/galley with 2 under counter cabinets. 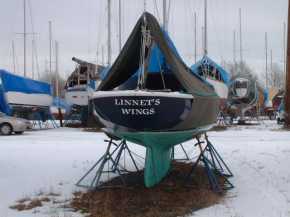 Sadly, it has come time that I must sell my 23' South Coast Seacraft Alberg sloop Linnet's Wings. I have loved having Linnet's Wings since the day my son Colin made it his mission to get it for me for Christmas 2000. 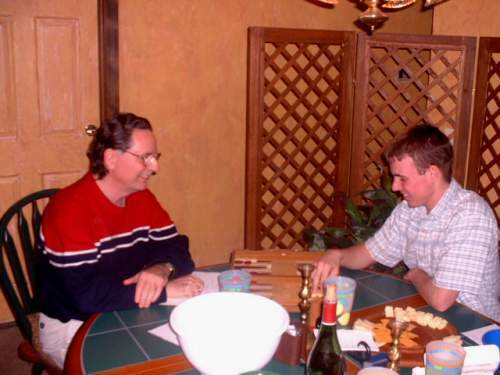 Colin and I going at it over the backgammon board at The Great 2006 Super Bowl Backgammon Tournament And Endzone Pile Up Party. 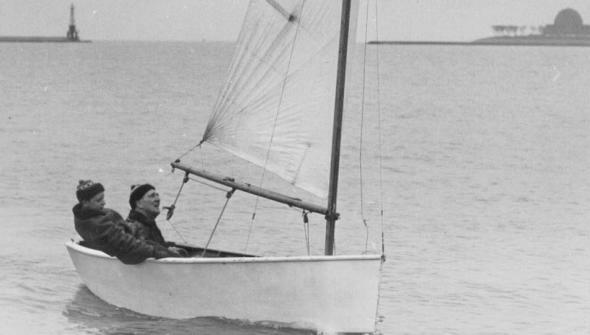 I learned to sail from my dad on Lake Michigan growing up in Chicago, IL. 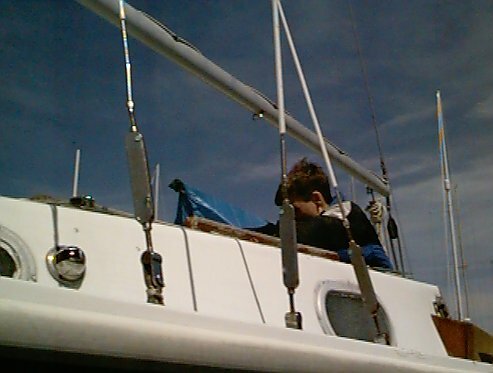 I started in a small Penguin class boat around the age of 7 and have been hooked on sailing since - some 50 years later. After getting my B.S. 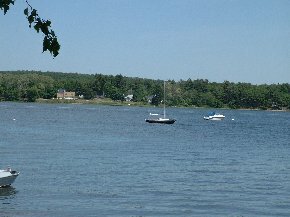 degree in physics in 1972, I moved out to the Portsmouth, NH where I had a small SailFish on the North Mill Pond where I had a home. 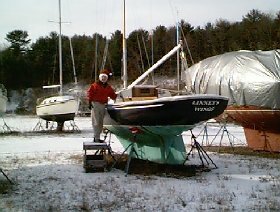 After moving to a house on the water in Dover, NH in 1996, I tore around the Piscataqua River basin area for years in an 18' O'Day daysailor until Christmas Day 2000 when I got Linnet's Wings. But a divorce has sent me off the water to a condo, and time, money, and an arthritic hip will not allow me any sailing time for the foreseeable future. So I have sadly come to the point where I must part with Linnet's Wings. 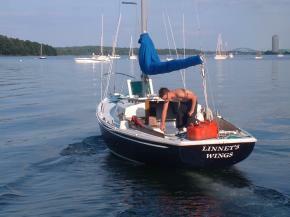 And so today, 08/03/04, Arden and Keith from Long Island drove up to look Linnet's Wings over. They must have fallen in love with her immediately as the deal was shaken over and sealed with little fanfare. It will be sad to let her go, but it is probably sadder for me to see her just sitting in her jack stands in the Great Bay Marine storage yard. They had stumbled into Linnet's Wings for sale page I had posted on this site, and emailed me as to how soon they could come up and look at her. It must have been over 100 degrees standing on the fore deck of Linnet's Wings as Arden gave her a thorough look over. 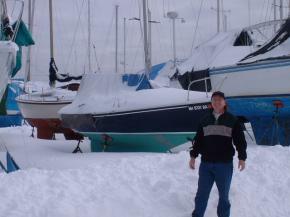 I bought us all cold sandwiches at the marina's Blue Latitudes Grill, we drove over and picked up her engine, and then back to my condo to get all of the sails and other gear. By 2:00pm it was done and I waved goodby to them as they pulled out of the parking area filled to the car's gunnels with all the boat gear. They will be sending a boat hauler truck up early next week to pick her up. I won't go back to see her again; I just want to remember her as she was when she was mine. 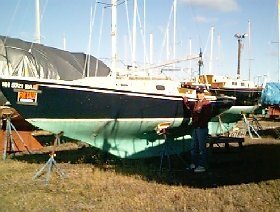 The early pictures show her condition prior to Colin giving her a full new under waterline paint job in 2002 and a brand new deep navy blue hull paint job in 2003. She has been out of the water since end of season 2003.